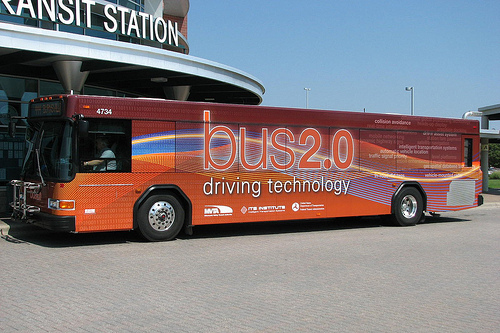 The Minnesota Valley Transit Authority wrapped 10 buses in a clever "Bus 2.0" livery to publicize new intelligent transport system (ITS) technology. Photo via EMBARQ. Today’s information-rich world enables city dwellers to share experiences on public transport faster than any transit agency could ever hope to publish a press release, develop a marketing campaign, or hold a news conference. An agency’s brand and message can be very easily co-opted by engaged customers, including, in the best case, well-meaning riders, or in the worst case, disgruntled customers holding a grudge. As a result, transit marketers must learn to lay off the spin and start laying on the truth. The point of the piece is simple. People have access to a vast array of experiences and options, more so than ever before. As a result, it’s not sufficient for companies to market their goods and services with slick ads that tell customers what’s so great about the product or why it’s better than an alternative, because those people can very easily see how their options stack up based on other people’s past experiences. Our ability as advertisers to contrive and disseminate an emotional response through advertising is diminishing rapidly. And brand exposure is not the same as brand experience. A single one-star review on Yelp trumps 60 seconds of Super Bowl airtime. Why does this matter to transit? Public transportation is a service that has to be sold to potential customers. More so than possibly any other service, transit service is an experiential one. Customers buy transit service because they need it, but they ultimately will choose not to buy it if they don’t like the experience. Over the past decade or so, transit agencies have wised up to the importance of marketing and branding. Unfortunately, the world of marketing and branding is changing just as fast as these agencies are catching on. It’s not enough anymore for a transit system to market itself as being better than some other mobility option, it has to actually be better than the other options. If a brand says “we want to be seen as X,” the correct response from a marketer is “Are you actually X?” or “Then go be X,” because no amount of positioning can swing the needle if you aren’t actually delivering the experience. At a time when information sharing between complete strangers is as simple as a few text messages, cities and transit agencies have to be extremely careful to communicate the benefits and outcomes of new projects accurately. The Massachusetts Bay Transportation Authority experienced problems nearly a decade ago when it built its new Silver Line, which was quickly dubbed “the Silver Lie” by Bostonians for its marketing as a new part of the city’s rapid rail network vis-a-vis its dismal on-the-ground performance. I can only imagine the backlash would have been significantly worse with the communication tools people have at their disposal today. This issue is particularly problematic with bus rapid transit (BRT) projects today. An exact definition of BRT is generally contested, leaving it open for various interpretations and, ultimately, confusion to potential riders. Curitiba, Brazil is hailed as the birthplace of BRT and often cited as the best example of successful BRT systems. Its success is a result of enormous investment of political and financial capital in the highest level of infrastructure available at the time. Only a handful of cities have replicated this level of investment, which also generally explains why so few cities have achieved similar success and outcomes. When cities push BRT projects and say, “Look how well it works in Curitiba!” they are setting themselves up for failure without some more clarification. A BRT line in Kansas City that consists of new, branded buses and higher-quality bus shelters with real-time arrival information is a good start, but it simply will not produce the same results that Transmilenio did in Bogota, Colombia. That doesn’t mean transit agencies shouldn’t move forward with incremental investments in better transit service. It simply means that cities need to be completely honest with their citizens about the results they can expect from new investments. Telling riders weekend track work will improve travel times by 3 minutes per trip and actually delivering those results will produce much better public support than saying it will reduce travel times by 10 minutes but only delivering a 5-minute reduction. As a transit marketer, I will say [you can’t] forget the most important marketing best practice: delivering consistently exceptional service. If you do that, your riders will do the marketing for you. Branding, service maps, and comment cards don’t matter if you can’t deliver. Jim Bonistalli, marketing director of Chicago-area commuter rail service Metra, puts it more bluntly: “You can have the best marketing program, but if the train is late, it doesn’t matter.” Of course this point is not new, but in an age when million dollar marketing campaigns can be discredited by one customer’s bad experience retweeted 500 times, it just becomes that much more pertinent. With gas prices rising and people clamoring for alternatives to the cost and stress of driving, public transit is enjoying the kind of positive attention it hasn’t seen in nearly a century. Cities shouldn’t squander this support and good will with over-hyped marketing but instead should communicate frequently and honestly.